>Both matte and long-wear lipstick tend to dry out your lips. In fact all balms or lipsticks that come in tubes contain waxes that tend to dry out your lips. Don't know about you guys, but I was surprised when I read these eye opening facts about lips and Lipsticks. I have always been a fuss free person and applying sunscreen every time I step out in the sun feels like a Herculean task to me. So after procrastinating for years, I have finally accepted that lip care is as important as your skin care routine. And that even your lips need daily scrubbing and moisturizing to stay their youthful self. Thanks to SkinCafe I was introduced to some amazing lip products and I tried these products for almost a month before I could give my verdict. Did you know that Skin Cafe's products are freshly made without any preservatives. They start manufacturing the products only after you place an order. So each product that is delivered to you is hand crafted specially for you with utmost care. They use zero preservatives and that is why they have to be used within 3 months from the manufacturing date. Hence they are sold in small 9 gm glass bottles. The lip scrubs, lip butter and tinted lip balms come in yummy flavors that smell heavenly. And I had a hard time keeping the products on my lips. I was so tempted to eat them. 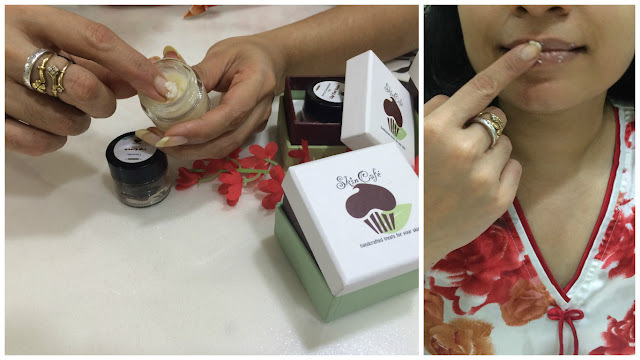 I was sent the Tiramisu Lip Scrub, Vanilla Creme Brulee Lip Butter and Apple Cranberry Pie Tinted Lip balm for review. 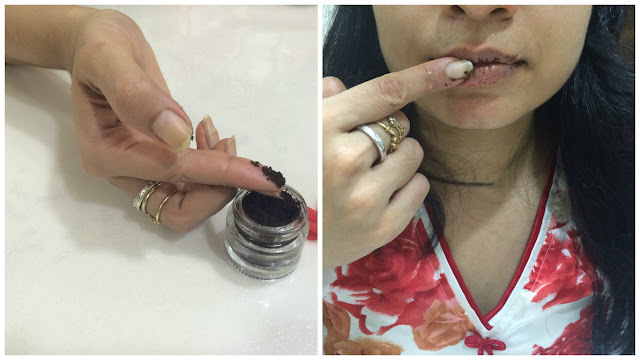 The Tiramisu scrub smells heavenly and its grainy texture is perfect for scrubbing your lips. Take pea size portion of the scrub on your fingers and massage it gently in circular motions on your wet lips for a minute. Wash off with water once done. After scrubbing your lips, it's time to seal your lips with a Lip Butter. SkinCafe's Vanilla Creme Brulee Lip Butter is an off white colored lip butter which smells like the Vanilla Creme Brulee you have tasted in some fancy restaurant. It is thick and moisturizing. The Apple Cranberry Pie Tinted Lip balm is a beautiful cherry pink lip balm thats thicks and creamy. It gives your lips a pinkish sheer colour and keeps your lips hydrated at the same time. I introduced a two step ritual to my bedtime beauty routine. I have been following this routine religiously for the past 20 days. And I love how my lips feel soft and supply all the time. I need to reapply the lip butter only twice/thrice a day at the most, compared to almost 8-10 reapplications that I previously did before I started using SkinCafe products. Even the tinted lip balm is something I have been addicted to. I use it every single time I step out. I love the dewy look it gives my lips and my lips love it too. :) So, if you are a beauty enthusiast and looking to start a lip care routine, I would recommend Skin Cafe to you without blinking an eye. Custom made freshly with natural ingredients, their products are so good, that you will be a loyalist for life. Tip: SkinCafe recommends using clean dry fingers, a lip brush, or maybe even the back-end of a clean spoon to grab any skin product from its packaging. If using fingers, flick the finger outwards, to push the product on top of your fingernail rather than beneath it. Again I envy you that you got to try these awesome products! :p I need a lip scrub badly! I love matte lippies more! Good to know info. Especially for me. Coz my lips are forever dry coz of acne tablets.